Rigid with concentration, Lessa lay in the straw of the redolent cheeseroom she shared as sleeping quarters with the other kitchen drudges. From the moment I read the phrase “redolent cheeseroom,” I knew that this was gonna be pretty hard to get through. I soldiered on (doing more skimming than reading) and almost forced myself to shut off my mind and get lost in it, but it was not easy. It’s very hard to believe that this novel won the awards that it did (it’s a fix-up, created by conjoining three novellas, including one that won the Hugo and one that won the Nebula). 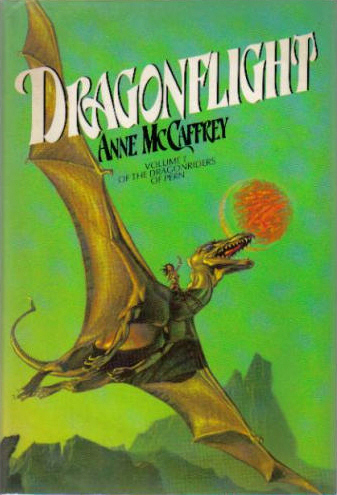 In both cases, McCaffrey was the first woman to win these awards, and her work has long been hailed as a classic of feminist science fiction. But…I don’t know, it’s had to believe that even back in the 60s, there was nothing better than this. Some people might say, “Oh, well, you know…this book was published in 1968, and back then this stuff was revolutionary.” But I find it hard to buy that. Here are some other SF books that came out in 1968: 2001; Camp Concentration; Nova; Do Androids Dream of Electric Sheep; The Iron Man; Stand on Zanzibar; and The Wizard of Earthsea. All of these books are so much better than Dragonflight that it’s almost impossible to believe that they exist in the same sort of cultural space. But, on the other hand, there is something about this book that resonated with people, even back then, and that resonated with me when I was ten years old. Oh well, at least the discussion was interesting. And I guess that even poorly-written adventure fantasy needed to have its glass ceiling broken. 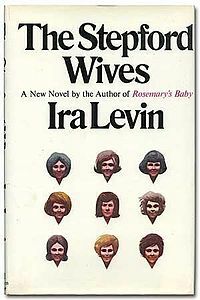 The Stepford Wives (1972) by Ira Levin — If you don’t know the premise of this novel, then you should probably stop reading, since I’m going to spoil it. This is a very short novel about a wife who moves to a small town where all the women have no personality: they only care for domestic household chores. The wife discovers that the women have all been replaced by robots. And that her husband is planning to replace her as well! I think this novel goes to show how important it can be to take that additional step. For most of the novel, the husband is portrayed as an enlightened man: someone who doesn’t mind that his wife is a professional photographer and a feminist. And it would’ve been so easy to preserve his enlightenment and paint him as a victim of this cabal of chauvinists. Instead, it was a stroke of genius to rip away his veneer of civilization and show that he’s just as bad as them. He–like all the rest of these men–felt threatened by her growing power, but was too afraid to confront her openly, so he plotted against her in secret: he lied to his wife and manipulated her and brought her to this place so she can be murdered and replaced with a simulation. However, I have to say that I don’t really enjoy that last act of so many novels, where the build-up is all finished and it becomes a thrill-ride, full of chases and stand-offs and such. I just don’t enjoy long descriptions of people running around. 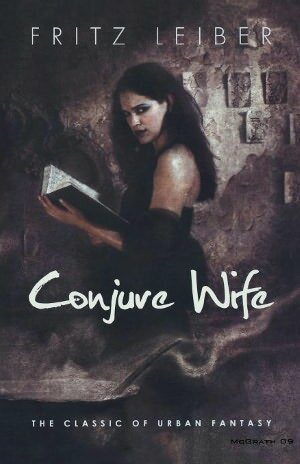 Conjure Wife (1943) by Fritz Leiber — This novel is crazy. It’s a campus novel wherein an up-and-coming comparative religions professor discovers that his wife has been using witchy rituals in order to try to advance his career. After forcing her to relinquish that superstitious nonsense, he discovers that all the other faculty wives are also using witchy rituals and that without his wife to protect him, he’s powerless against them. This is another example of a novel that made some good decisions. In this case, I think the best one was to carefully calibrate exactly how much the wives know about magic. There’s an implication, in the book, that all women know magic and that all women use it to help their husbands, but I think it would’ve been very easy to fall into the traditional sitcom paradigm where women are preternaturally wise and men are complete buffoons. In this case, the wives practice magic, but they’re not fully in control of it. It’s something that they feel their way through and discover by happenstance and keep secret even from each other. The whole magical element is handled with incredible dexterity. And it’s quite amusing to see it mixed up with small-college politics.